If you use electricity to heat your home, consider installing an energy-efficient heat pump system. Heat pumps are the most efficient form of electric heating in mild and moderate climates, providing two to three times more heating than the equivalent amount of energy they consume in electricity. A heat pump can save as much as 30% to 40% of the electricity you use for heating. With many years of experience in the HVAC industry, Precision Air is your best local choice for heat pump heating. We specialize in ground source (also known as geothermal) heat pumps, which are more efficient and economical to operate when compared to conventional air source heat pumps, especially in climates with similar heating and cooling loads. Interested in finding out more about heat pumps and your home? Schedule a free estimate with Precision Air today in Greater Nashville! Precision Air specializes in a variety of heating services, including heat pump installation, geothermal heat pumps, energy-efficient furnace repair and replacement and more! 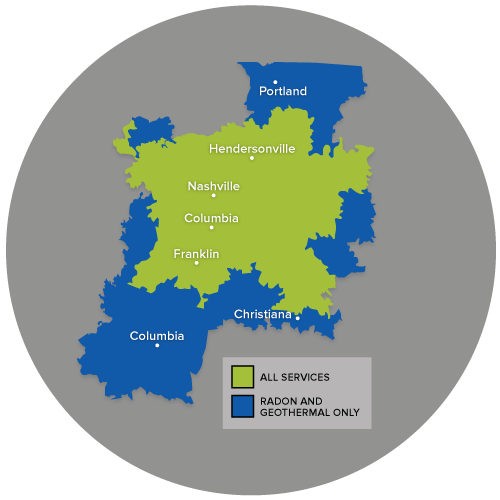 Call us or contact us online for a free heating estimate in Franklin, Nashville, Murfreesboro, Antioch, Hendersonville, Brentwood, Smyrna, Lascassas, Madison, Hermitage and nearby.